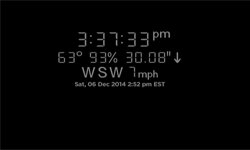 CLOC provides a simple display of the current time and weather as LED-style characters on a black background. You can choose to display any or all of the following readings based on your zip code: Temperature, humidity, barometric pressure, wind, and the timestamp of when those conditions were recorded. CLOC is the most popular screensaver in the Roku Channel Store, and was also selected as one of RokuGuide's Top 5 Roku Screensavers. Note that this screensaver is listed as LED Time & Weather in your Roku settings menu. If you're a true weather nut, then you'll want to install Weather4us, which is both a weather app and a screensaver. As a screensaver, Weather4us displays information differently from other time and weather screensavers. With Weather4us you can select up to 32 different weather displays, and your Roku will cycle through these as a slideshow. If you're looking for nothing more than the current weather conditions in your city, then select the Current Temperature slide. Your screensaver will then display a screen with temperature, humidity, wind speed, barometric pressure, and other current conditions. Other slides include latest radar, today's national forecast, latest sun image, current moon phase, and even current Northern Lights activity. That only scratches the surface; select all 32 displays and you'll also find maps of the UV index forecast, wave height forecast, infrared satellite, 6-hour snowfall forecast, and several aviation forecasts. If the National Weather Service publishes a map, you'll probably be able to add it to your screensaver. If you only need time and current conditions, there are several other screensavers that are up to the task. 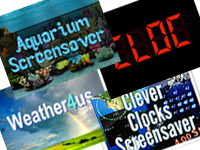 However, the remaining screensavers that offer both time and weather limit the weather conditions to temperature. You won't find humidity, barometric pressure, and wind speed and direction as were available with CLOC (which is listed as LED Clock & Weather in your Screensaver menu). 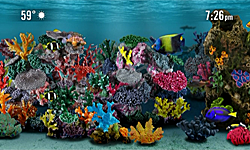 Still my favorite, Aquarium Screensaver will fill your screen with a wonderful rendition of a tropical coral reef, complete with fish swimming back and forth. You will also find the current temperature with weather conditions (sunny, overcast, etc.) depicted by an icon. This screensaver shows the current time in 10 different formats. 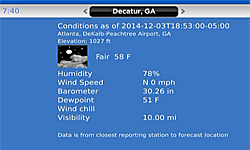 Many of those formats also show current temperature and text-based weather conditions (clear, overcast, etc.). 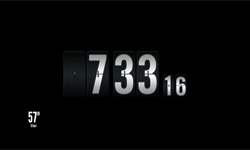 You can pick a single clock style, or randomize through all ten. You won't find the LED format provided by CLOC, but the Flip Clock option provides a decade-earlier display.